Home Farm House has teamed up with Adventure Bike Hire to offer our guests the opportunity to create a tailor made cycle holiday. 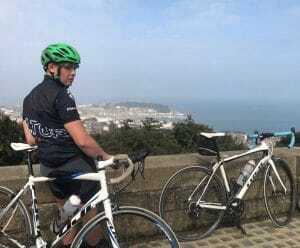 With the tour de Yorkshire becoming an ever more important date in the calendar for keen cyclists, Scarborough is fast becoming the place for a cyclists holiday. Not only road cyclists enjoying the challenging hills and vales surrounding the town but also mountain bikers are catered for at Dalby Forest. Equally, families with children can find easy safe cycle paths in the town. Between the 3rd to 6th May 2018 there will be world class road cycling taking place across Yorkshire for the third year. It is one of the biggest cycle races in the UK and an outstanding event in the international cycling calendar to be broadcast to the world. The end of stage 3 will be in Scarborough and it will be an amazing to be there. 2.2 milion people are expected to come out and watch the race in total so booking your place to stay so as not to miss this special event is crucial. For mountain bikers, Dalby Forest just outside Scarborough has several outstanding trails which correspond to the standard IMBA and Forestry commission grading scheme. There are different levels of difficulty with two green trails following forestry roads, a red, a blue and a black trail. The red trail is the longest exploring much of the forest and requiring some technical proficiency. The black trail is highly technical providing a challenge to the most skilled of mountain bikers. There is also a really popular “slope style”area with jumps etc. Let’s not forget families with young children that just want a safe gentle cycle path; the cinder track provides just that. The Cinder Track follows the route of the old Scarborough to Whitby railway which is now part of the National Cycle Network for 21 miles.